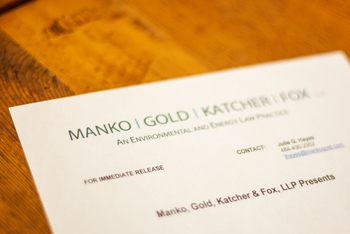 Manko, Gold, Katcher & Fox partners Rodd Bender and Nicole Moshang presented “Emerging Issues in Environmental Law: Impacting Real Estate Acquisition, Development and Ownership,” on Tuesday August 8, 2017. Yolanda Rodriguez, Assistant Vice President and Counsel at Toll Brothers, Inc. rounded out the panel. The program was part of the one-day Ethics, Real Estate, Contracts & Commercial Law CLE Institute in King of Prussia, PA sponsored by the Greater Philadelphia Chapter of the Association of Corporate Counsel (ACC).